Quite the mysterious title eh? Stirs up images of the Fall weather coming doesn't it? Well, I just had to put on sweatpants because it's a glorious chilly morning here and my shorts just weren't doing it. My betta's house is a tad bit cool at 76F whereas, he likes closer to 80F, but he'll have to deal as I like my house cold. Spent three hours yesterday on the computer uploading pictures to Pinterest. I had been seriously slacking in that department since the App pissed me off and wouldn't upload in a timely fashion. Seems not ONE person even gives a crap as there is no activity on there at this point in time. Ah what I do for the nonexistent. Have you see the Louboutin nail polish? You bet I bought the red one. I've yet to wear it, but the fancy bottle sits proudly on my dresser in my bedroom for decoration. There are now 30 other colors released. The bottles are similar, but not quite as fancy. The different collections have different colored handles. From silver to steel grey to rosy. I want them all!!!! Here's my thought. 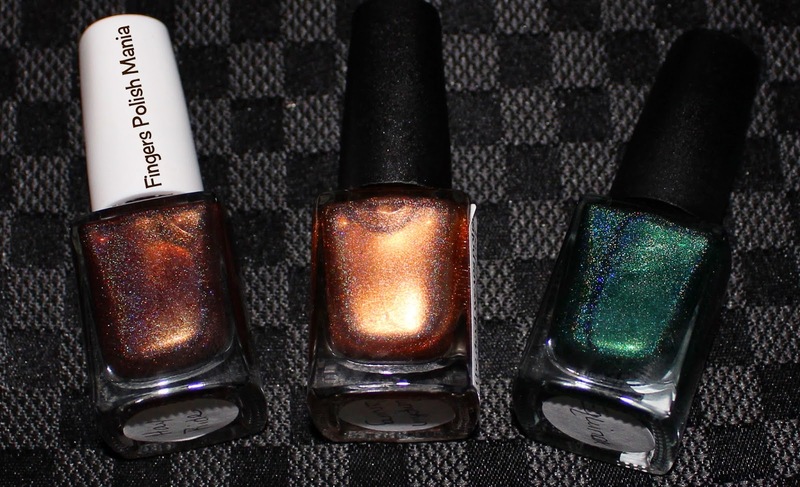 I want to sell off ALL my non holo polish, buy up all the Louboutin polish and just use those gorgeous pretties from here on out. Anyone want to buy my stash? Let me know. I am semi not kidding here. 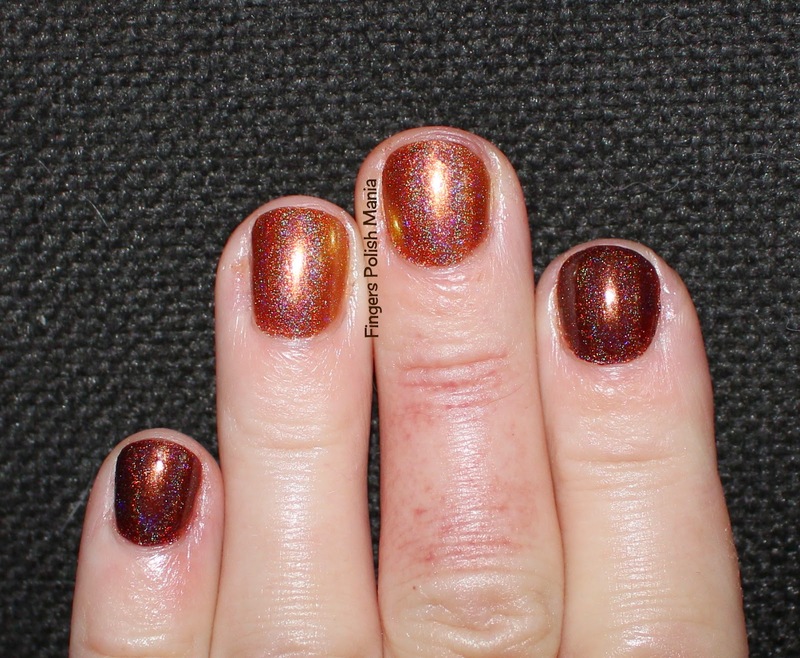 I am planning on selling off some more of my polish, but I still have SO much on my blog sale, that it worries me that things aren't going to sell. I need to open a Store Envy and go from there. But damn that's a lot of work. All those pictures, all that cropping and uploading and info. Meh. 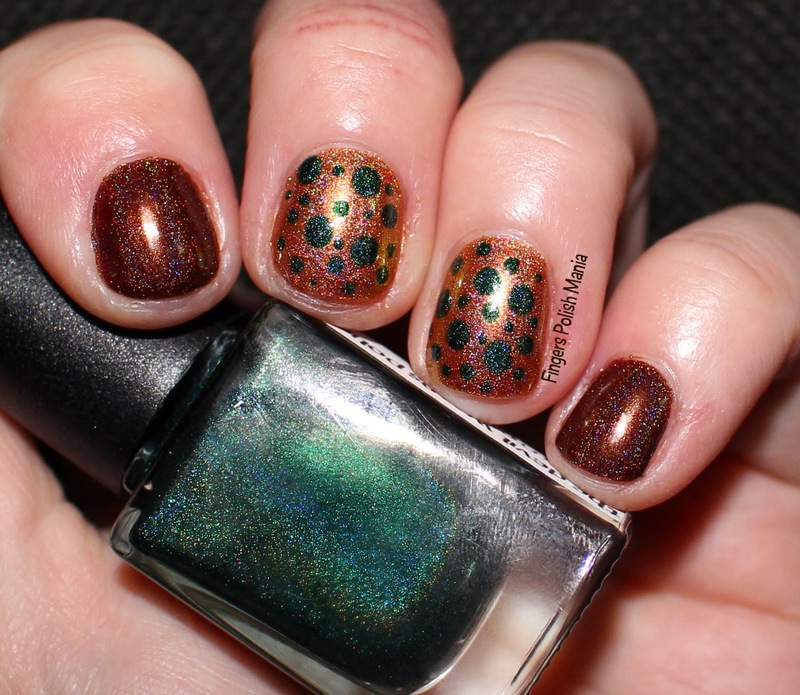 Let's talk a brand new to me called The Devil Wears Polish. She just put out a set of EIGHT brown holos. EIGHT people! You know how I love my browns. Yes I bought the set. I have yet to show them as I just got them in the mail! Today though, I will be showing you three of her Fall colors not in this set. As the title states, this is Hayride, Pumpkin Carving and Equinox. Before we go on, I will warn you the super nubs are back. I spent a lot of time yesterday filing them all the way down then gluing the peeled areas. I subsequently glued my nails to my skin and had to remedy that before polishing. By this time I was in no mood for anything fancy. 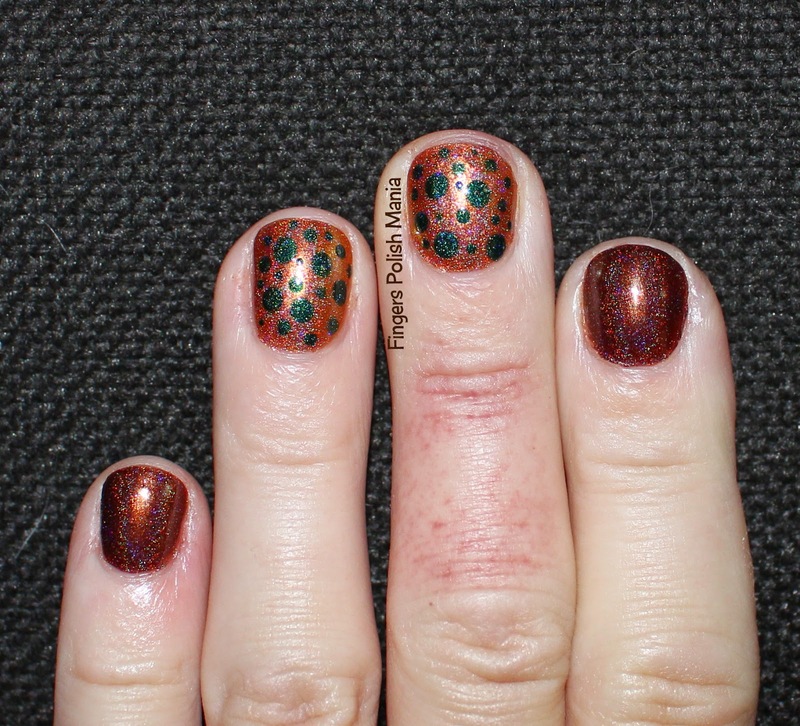 Normally I don't point stuff out as you wouldn't notice if I didn't, but at the point of picture time, I got this weird rash on my middle finger. It's gone now of course. 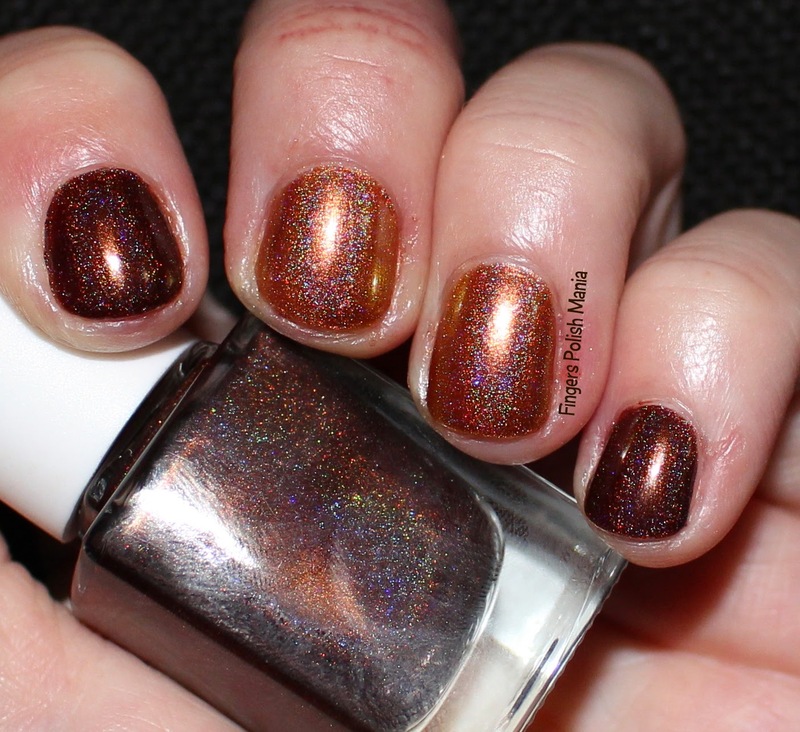 These holos are gorgeous. My kind of colors. I wish the sun had been out to see what would happen there. Next time for sure. I simply did some dots. I need to wear this green alone. I'm betting it's a stunner for sure! Another random thought-did Blogger change the HTML font? Seems totally different to me.